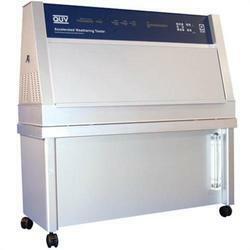 Prominent & Leading Exporter from Hyderabad, we offer uv weathering tester. This apparatus uses fluorescent uv lamps to reproduce the damaging effects of sunlight. Although ultra violet (uv) light makes up only about 5% of sunlight, its responsible for most of the sunlight damage to the polymer / rubber/ non metallic materials exposed outdoors. Therefore, if it is only necessary to reproduce the short wavelength uv for testing polymer rubber degradation. An apparatus for accelerated weathering testing specimens including discharge lamps as a concentrated light source for accelerating the deterioration of color, composition and/or structure of test specimens. Improved control calibration structures and methods of operation are also included. The test module to monitor the weathering test process from an improved location, detecting irradiance in the manner in which the specimens are exposed to such irradiance. The test modules are mounted in a pocket formed within the door for the test chamber such that the sensitive electronics of the modules are not exposed to the harsh environment within the test chamber, resulting in an exceptionally stable signal. UV light absorbers: Absorbers convert harmful ultraviolet radiation to harmless infrared radiation or thermal energy, which is dissipated through the polymer matrix. They can be either transparent as hydroxybenzophenone or opaque like carbon black. Carbon black is one the most efficient and widespread light absorbers. Its efficiency as a uv absorber depends primarily on the primary particle size and structure. At the same loading, carbon black aggregates based on fine prime particles will present more surface to incident light - and hence a larger ultraviolet light absorbing efficiency - than a coarser grade. The appropriate loading level depends on the part thickness, exposure conditions and type of carbon black. Usual loadings to impart optimum uv protection vary between 2 and 3% (it should be noted that these carbon black levels correspond to 4 to 7% master batch, depending on their loading). Looking for UV Weathering Tester ?